Recent calls have been made to shift the focus of mobile learning discussions from technical implementation to pedagogical strategies. However, a lack of a sense of self-efficacy amongst educators has been identified as a barrier to the successful integration of mobile learning resources into teaching practice (Ally, Farias, Gitsaki, Jones, MacLeod, Power & Stein, 2013). 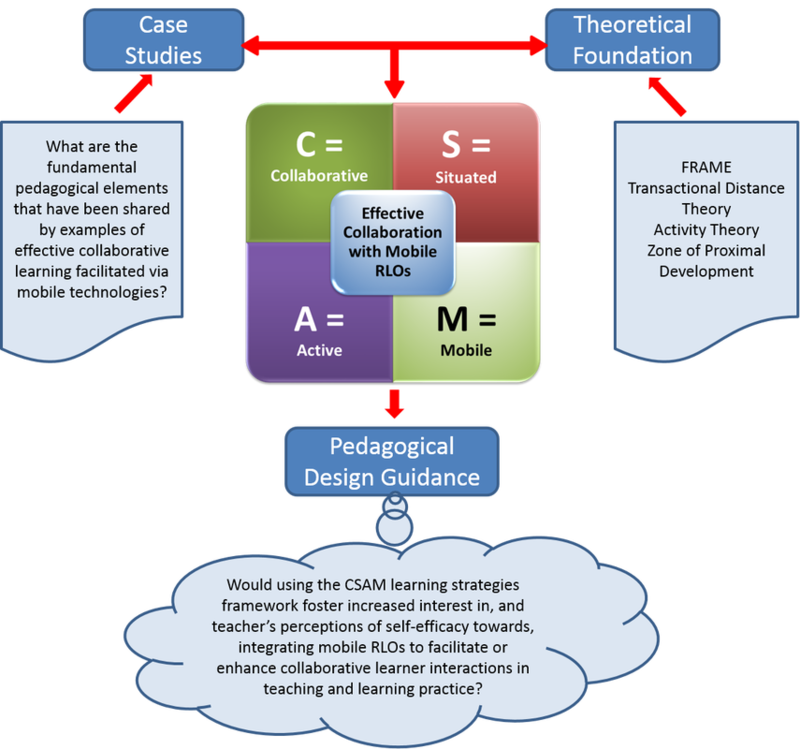 This research study outlines the distillation of the Collaborative Situated Active Mobile (CSAM) learning design framework, which represents the key pedagogical components of collaborative mobile reusable learning objects (RLOs). This study examined increases in teachers’ perceptions of self-efficacy with mobile learning after participating in an online professional development course focused on using CSAM to guide the design and development of mobile RLOs. A mixed-methodologies approach was used to measure changes in perceptions of self-efficacy, and to contextualize participants’ perceptions of the influence of the CSAM framework. After completing the professional development course, participants were motivated to integrate mobile RLOs into their teaching practice. Participants also felt more confident with using mobile RLOs, and they perceived the CSAM framework to be a useful tool for providing guidance for instructional design and reflective practice. The findings from this study are consistent with the rationale behind recent professional development policy recommendations (DeMonte, 2013; Koehler & Mishra, 2008; mdk12.org, 2014; National College for School Leadership, 2003), and add further support to calls to contextualize educational technology training in the context of supporting pedagogical decision-making. Findings from this study have resulted in recommendations for improvements for future iterations of the CSAM professional development course, as well as recommendations for future research into the use of pedagogical frameworks to help teachers increase their perceptions of self-efficacy with mobile learning. 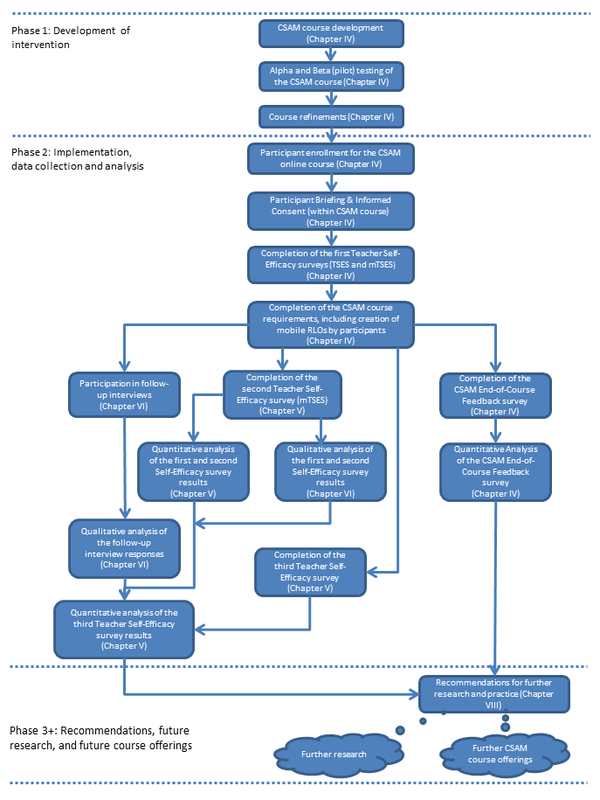 The conceptual framework illustrates how case studies of practice, coupled with the theoretical underpinnings of key models of mobile learning research and practice, such as the framework for the rational analysis of mobile education (FRAME) (Koole, 2009), have influenced the Collaborative Situated Active Mobile learning design framework. This has resulted in a framework for pedagogical design guidance and reflective practice for integrating mobile RLOs to facilitate collaborative learner interactions. Stemming from this process is the central problem, or question, explored by this study – whether the use of the CSAM framework has a positive effect on teachers’ interest and perceptions of self-efficacy surrounding the use of mLearning RLOs. While a significant body of research exists on learners’ feelings of self-efficacy concerning computer technology, online learning, and even podcasting (e.g., Compeau & Higgins, 1995; Hodges, Stackpole-Hodges, & Cox, 2008; Johnson, 2005; Kao & Tsai, 2009; Koh & Frick, 2009; Liang and Wu, 2010; Loftus, 2009), this concept does not yet appear to have been examined in any detail in a mobile learning context (p. 2). The purpose of this research study was to determine if the Collaborative Situated Active Mobile learning design framework, derived from key pedagogical elements of mobile collaborative learning case studies, could help individual educators overcome barriers of perception, become more interested in integrating mobile learning teaching strategies into practice, and increase their sense of self-efficacy in using mobile learning pedagogical strategies to facilitate or enhance collaborative learner interactions. The creation of the conceptual framework and statement of a discrete problem to explore led to the formulation of the primary questions that formed the basis of research study. Does the Collaborative Situated Active Mobile (CSAM) learning design framework provide teachers with an increased sense of self-efficacy in the use of mobile reusable learning objects (RLOs) to facilitate or enhance collaborative learner interactions? Do teachers perceive greater self-efficacy when using the CSAM framework? Do teachers perceive their use of mobile RLOs to be more effective when using the CSAM framework? Participants enjoyed the professional development course. Participants expressed a perception that the CSAM framework had helped to increase their understanding of, and confidence with, designing and using mobile RLOs. 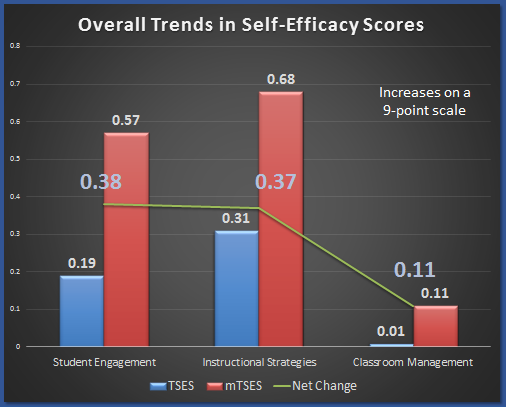 The mTSES results demonstrate increases in participants’ perceptions of self efficacy. Participants expressed increased interest in integrating mobile RLOs into their teaching practice. These findings provide an affirmative answer to the initial research question. That is – the CSAM learning design framework does provide teachers with an increased sense of self-efficacy in the use of mobile reusable learning objects (RLOs) to facilitate or enhance collaborative learner interactions. This research study was significant because it demonstrated the utility of the Collaborative Situated Active Mobile learning design framework in helping to prepare teachers to make use of mobile learning strategies in instructional design. This study explored the potential for professional development training focused on the CSAM framework to increase teachers’ perceptions of self-efficacy with respect to mobile learning, particularly with respect to the development and use of mobile reusable learning objects (RLOs). This study also resulted in the development of an instrument that can be used to gauge teachers’ perceptions of self-efficacy with respect to the use of mobile RLOs. The Mobile Teacher’s Sense of Efficacy Scale (mTSES) survey is significant because it can be used to compare the effects of training interventions on teachers’ perceptions of self-efficacy with mobile learning strategies. From the perspective of distance education research and practice, this study was significant because it explored issues of instructional design competency and teachers’ perceptions of self-efficacy with the use of technologies that are becoming increasingly pervasive. As mobile technologies become increasingly pervasive, they are becoming a mainstream mode of accessing learning opportunities and learning content. The evolution and growing pervasiveness of technologies available to mediate access to education is resulting in breakdowns in the distinctions between different modes of learning, such as face-to-face, distance or distributed learning, and mobile learning. Mobile technologies will play an increasingly common role in the design and delivery of education (Ally, 2014). This research was significant from the perspective that it has contributed to the body of knowledge about how to better prepare teachers to integrate mobile learning strategies and resources into instructional design at any level of the education system. The following video is a rehearsal of my oral dissertation defense presentation. My actual oral dissertation defense examination took place in January 2015.